Government of India, Ministry of Railways, Railway Recruitment Boards has advertised the RRB Group D notification for the recruitment of 62907 Group ‘D’ vacancies. RRB Group D Cut Off Marks for the year 2018 in CBT examination will make a candidate’s success in the final merit list. 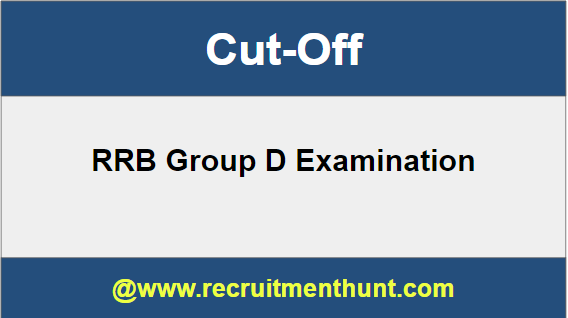 RRB Group D Cut Off Marks are the Minimum Marks that all the aspirants must and should secure in the Group D examination. RRB Group D Cut Off 2018 depends upon many of factors. RRB Group D Cut Off to be decided by railway recruitment board based on aspirants performance in the examination. In the above table, we enclose complete information of Indian Railway Recruitment Group D Jobs for applicant’s sake. So, Interested Candidates can check Indian Railway Group D Vacancy on our website. Moreover, It is a wonderful opportunity for Candidates who are looking for Railway Jobs can use the chance for their career growth in a Government Sector. Hence, aspirants should also check RRB Group D Recruitment Vacancies along with Eligibility Criteria conditions. For more details refer Indian Railway official website www.indianrailways.gov.in. Indian Railways is offering an excellent opportunity for Railway job seekers. Number of Candidates applying for the Group D Posts. Category Cut off Set by the Indian Railways Authority. The difficulty level of the Examinations. The Minimum cut off score set by the RRB Indian Railways Authority as per the norms. How to Check your RRB Group D Cut Off? Download your scorecard for future reference. Candidates who are looking for RRB Group D Cut Off Can go through thsi steps which may help you in Checking Cut Off Scores. Negative Marking: There shall be negative marking for incorrect answers in the CBT. 1/3 of the marks allotted for each question shall be deducted for the wronganswer. Candidates can refer this category wise expected Cut Off Score as an reference. Moreover, It helps aspirants to prepare well for the Exam. Finally Candidates can download Railway Group D Cut-Off here. So, Applicants can make their preparation easier by following Railway Group D Syllabus. Download Railway Group D Exam Patterns along with Railway Group D Previous Papers 2018-19 on this article. Also, For more Job Updates stay Tuned to our site Recruitment Hunt. Also, for more sarkari naukri updates, please visit Recruitment Hunt.